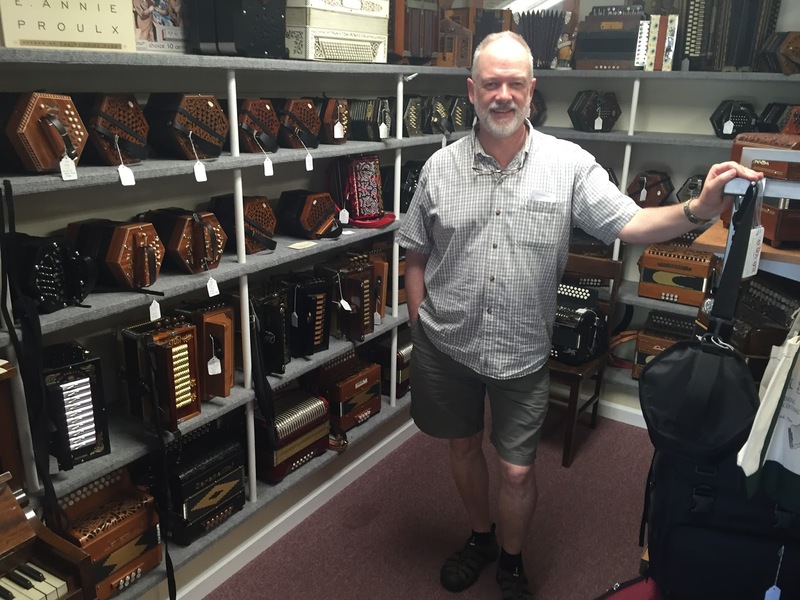 I found myself spending a day working in Connecticut, and decided on a whim to cut out early and take a swing to The Button Box, a mere two point five hours away, and a genuine melodeon mecca. While the trip to Sunderland, Mass., did have a whiff of the sacred to it, there was no penitence, penance, or redemption involved, just the sort of prosaic joys that give one hope in the world. There was a Dino Baffetti three row, big button, five coupler Tex-Mex machine in Tex-Mex colors that sounded wonderful but … defeated me. 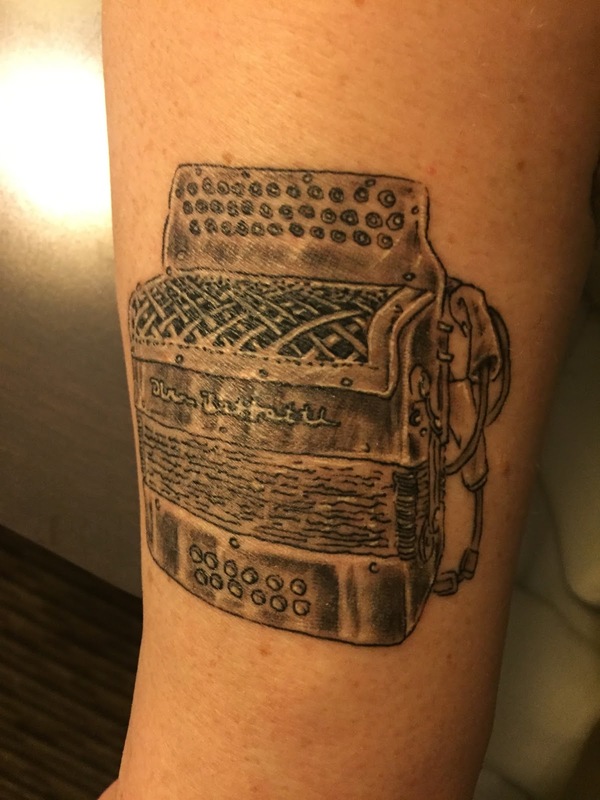 I think I’ve found the limit in size for me for an accordion. If I find myself using gravity to assist on the pulls, then it’s too much! There was a flock of one row boxes in D. Maybe they’ve suddenly gone out of style and thus are ending up on Doug’s shelves? Unlikely, as these were things of beauty. I was interested in trying out the two Castagnari Max boxes, one used for a mere $1995, the other new for $2525 (I see the used one is gone, now.) Try as I might I could not talk myself out of coveting those. I also tried a Pointe Noir box which was an absolute joy, but is in Cajun temperament. My band mates are already pissed off at me for having to tune to the three rows of reeds on the Saltarelle. Best of all, of course, was catching up with Doug, who I am shocked to realize I have known for eighteen years! Aside from being a Dad, there is nothing I’ve done for eighteen years together. But I still remember, vividly, buying my first box from Doug, the mighty Corso. Also, there was a way cool dog, and I bought some shirts. 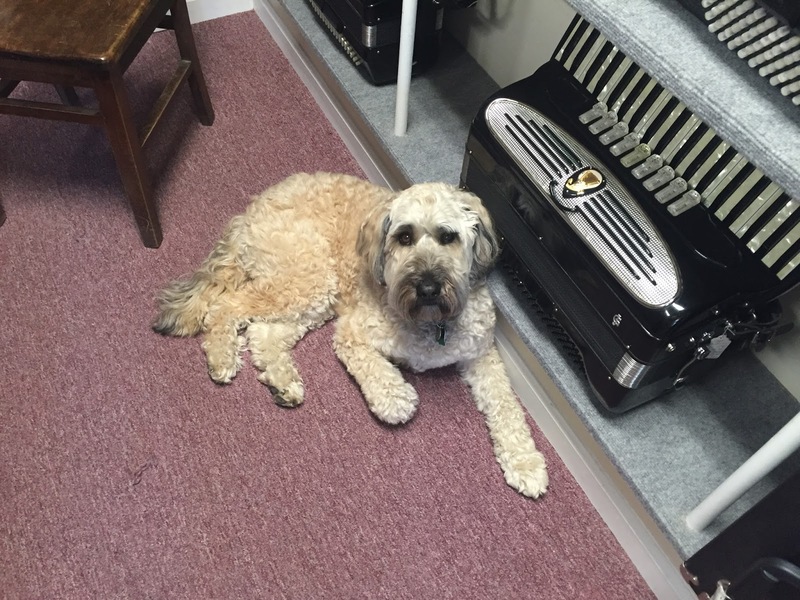 This is Florence Glorion a player of the chromatic button accordion, who duets often with diato player Florence Pindivic. 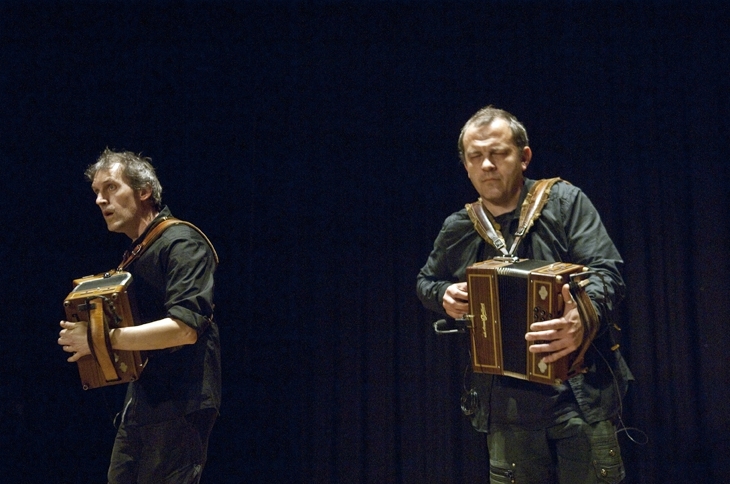 They host a site together, Diou Flo, which focuses primarily on Breton music. I love both of the Florences’ music, and will feature Pindivic next week. A bit of Alain Pennec to start off your week. He’s known for deploying interesting band arrangements, so capturing him solo is a special treat. Enjoy. 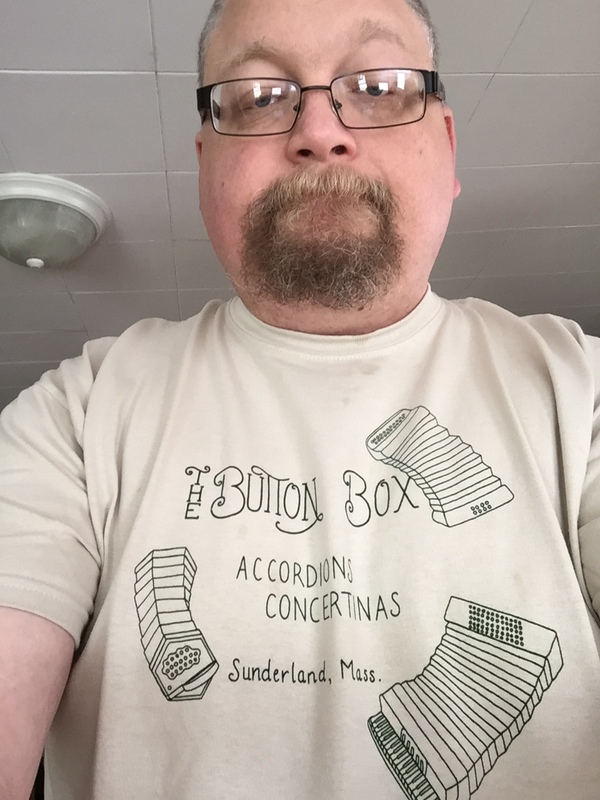 Just a few months after getting the tattoo of my beloved Hohner Erica, I’ve gone and finished the set. Below you can see may latest ink, a rendering by Moonman Sam of the Black Baffetti — my Dino Baffetti three-row Tex-Mex. I love the R. Crumb style. This will probably be my last ink for a while … at least until I get another box! Not to say Didier Laloy, Wim Claeys, Bruno LeTron, and Frédéric Malempré are Belgian — maybe they are, maybe they aren’t — but this musical movement, with the Handry 18 Castagnaries surrounding you, coming right at you … (the grillwork! the grillwork!) … feels Belgian. En Flanders, as Frédéric Paris might say. So, this is Tref! Enjoy! Didier Laloy is one of the great “Belgian-Handry-18” players — along with Francois Heim and Bruno LeTron — playing with a sensitivity that can be striking. He’s also a wildly and theatrically physical player, though you won’t see that in this piece. Enjoy.